Jeans get tighter, bikinis get smaller, tube socks get higher, afros gets bigger and colors get brighter. It’s all about spreading the plumage for everyone to see. From leisure suits to Wallabees, fashions take on the decade of excessive behavior in a storm of polyester, iron-ons and platform shoes. 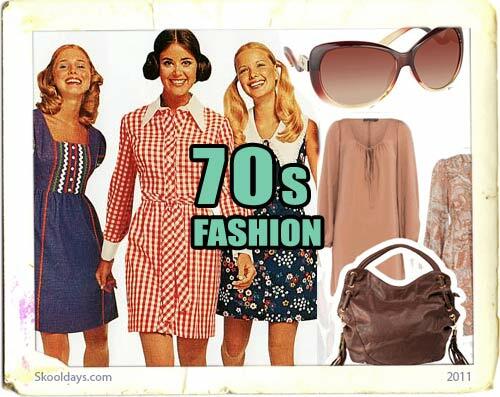 This entry was posted in Fashion and tagged 1970 by Skooldays. Bookmark the permalink. Any info or pics on the early ’70’s Mexican peasant shirts? They were generally white muslin with an embroidered band across the front and back and over the shoulders. The original ones had puffed short sleeves with a gathered edge that you had to cinch up yourself and tie the string in a little bow. They were embroidered with cotton embroidery floss, and the sleeves were attached with a little back and forth stitch sewn by hand with the floss. (The later versions were embroidered with yarn and didn’t look quite as nice) They were so great with a pair of jeans. I would love to see one again!